11.17.2004 - This was certainly one of my more unusual jobs. 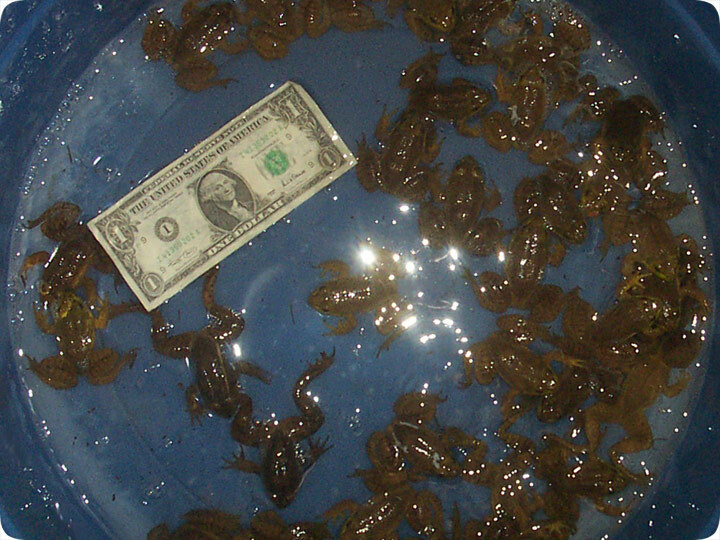 A lady called me, stating that her swimming pool was full of frogs, and she asked me if I could remove them. Although this was uncharted territory for me, the fact is that many of my jobs are actually uncharted territory, and this didn't sound terribly difficult. I figured that I'd show up, and by hook or by crook, I'd catch those frogs and save the day. So we scheduled a time and I showed up, but I soon realized that I needed neither hook nor crook, but rather a net. I had some nets, but the size of the pool made the skimmer a fairly handy tool for catching the roving croakers. The lady had carefully observed the frogs over the past few days. She believed that there were 34 frogs in the pool. I found the hole in her screen that allowed them to get in, and I patched it shut. I don't know why they had selected this pool for a mass migration, but there they were, and the lady didn't want them. I set about catching them, like this: Some I grabbed by hand, some I got with the net. Some I caught on land, and some I caught were wet. Some of the frogs were hopping, some of them were swimming. But I was not stopping and shortly I was winning. They were in the pool no more; the frogs were in my bucket. I could not find all 34, so I just said screw it. But then the lady said, "Check the filter" and I found another three. This brought my total to 36, and so I said, "pay me". The lady said, "A dollar a frog", but I said, "Make it two". So she gave me 68 smackers and then I bid adieu. The end. Do it yourself: Visit my How To Get Rid of Frogs page for tips and advice. (ME) Interesting! It sounds like the neighbor is very distressed. Some people are picky about sleep. I personally like frogs and like having them around, and I even like their croaking. But if I were bothering a neighbor's sleep, I would catch the frog and relocate it to another pond. Or I'd ask the neighbor to do so, since they're the one with the complaint. I know that your neighbors sound picky and fussy, but I've dealt with noise problems before (a neighbor's barking dog) and it frustrated me very much for a long time. A good night's sleep is important! (ME) Well then, leave the frog be.